The purchase of a motel or caravan park lease is a specialised process and should be approached with the assistance of industry professionals. It is essential that an industry expert accountant review the financial records of the business and ensure that the net profit after rent can be verified. The accountant will also provide tax planning advice, assist with the setting up of business entities including companies and trusts and complete cash flow forecasts for the business. The accountant can also be of invaluable assistance in framing the business plan that will be required by the lender in support of the finance application. The purchaser’s lawyer should be familiar with commercial leases and particularly motel and caravan park leases. The validity of the lease, rent review triggers and terms, the vendor’s right to sell and the obligations of the lessee are all areas requiring specialist legal advice. 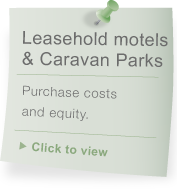 Motel and caravan park leasehold finance is also highly specialized. Most banks will lend around 50% of the value of a going concern motel lease. Terms will usually be dictated by the term of the lease with 15 years Principal and Interest being common. The lender will require security by way of a charge over the motel lease together with a landlord’s deed of consent and right of entry. The deed of consent is required as most motel leases include a provision which obligates the lessee to have the land lord’s approval in terms of the lease being used as security for a loan. The bank will require a right of entry as this allows them to enter the motel and operate it should the borrower default on the loan. 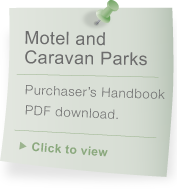 Lenders will require the motel or caravan park lease to be valued by an industry expert valuer. The costs can be substantial and must be covered by the borrower. Likewise, the costs of preparing the specialised security documents required can also be significant and should be allowed for when the motel or caravan park lease purchaser is calculating the total costs of purchase and finance. Many motels and caravan parks continue to generate a significant return on investment and can be a great opportunity for operators to derive substantial returns on capital invested. While the purchase and finance process can be intimidating for first time entrants the use of specialists in all fields will certainly make the process that much easier. For purchasers buying a going concern motel or caravan park (either freehold or as lessee) it is essential that an industry expert accounting firm undertake a review of the historical and potential future trading performance of the business. This review should include a physical visit to the premises, an interview with the vendor and full access to all booking and financial management systems. The accountant’s verification report is the key document in both the purchase and the finance process. Your accountant will also assist with ensuring you purchase in the appropriate entity structure and plan to maximize any taxation advantages associated with your new business. We are happy to recommend suitably qualified accountants to assist you in this process. There are a number of insurable risks that should be covered when purchasing a motel or caravan park. The nature of these risks will depend on the individual business and whether you are operating the business or simply purchasing the freehold as an investment. The lease will certainly outline the insurance obligations of the parties. The lender will also need to know that you have insured for Public Liability and Property damage as a minimum. It is considered prudent to look at insurance for business interruption, loss of income and to cover management costs should the operator fall ill. We are happy to recommend a suitably qualified accommodation industry expert insurance advisor. There is no specific license required in order to operate a motel or caravan park. However, dependent on the individual business there may be a need for licenses pertaining to the service of liquor and the preparation of cooked meals. In the case of liquor licenses there may also be a need to attend a training course and seek a specific qualification in terms of the responsible sale of liquor (RSA). Licenses are generally transferred at settlement. You should engage an accommodation industry expert lawyer to assist you with the transaction and review the contracts, lease and associated documents. A lawyer experienced in leasehold motel and caravan park transactions will provide essential advice as to the commercial risks associated with individual leases. Your lawyer will also assist with license transfers and the execution of bank documents once finance is approved. We are happy to recommend a suitably qualified accommodation industry expert lawyer appropriate to your individual situation and geographic location. Your lender will place significant importance on your future plans for the motel or caravan park you are purchasing. This is especially true if you have not operated such a business before. You should draw up a business plan outlining your plans for the business and your objectives in terms of future improvements, marketing, management and risk assessment. Your plan should include a start-up cash flow reflecting appropriate working capital allowances which would include acquisition costs, rent in advance and day to day operating capital requirements. A personal resume outlining your past business, work and life experience together with details of any formal qualifications will also be highly regarded by the lender. We are happy to assist you with feedback once you have prepared your draft business plan and resume. Your motel industry expert accountant will also be able to provide assistance with business planning and cash flow forecasts.